Eryldene was built in 1917 by Professor Waterhouse in the leafy suburb of Gordon. There he pursued his passion for camellias planting, researching and propogating them. Many camellias thrive in the garden to this day and it is known as the spiritual home of camellias in Australia. The Trust that administers Eryldene organized a “Japanese Art Weekend on 14th and 15th of September. Activities included Displays of Flower Arrangement by the Sogetsu School, Kimino Dressing Demonstration and Parade, Tea Ceremony Demonstration and Shakahatchi Concerts by Riley Lee. Stalls selling camellias, Japanese teas and Antiques were also present. Most activities were set on the old Tennis Court at the rear of the house. This is a ideal location because along with the perfect spring weather the flat grassed area is surrounded by wisterias,camellias and large trees. A small Chinese style pavillion is set in one side among the camellia bushes. This ambience of the location was both relaxed and conducive to Cultural Exchange. Three tatami were installed in the pavillion along with bamboo screens, flowers, scroll and appropriate dogu. A small audio system assisted the narrator. Demonstrations were held on both days at 1 p.m. The small Saturday audience was a little difficult to engage, however the larger Sunday audience was very interested. 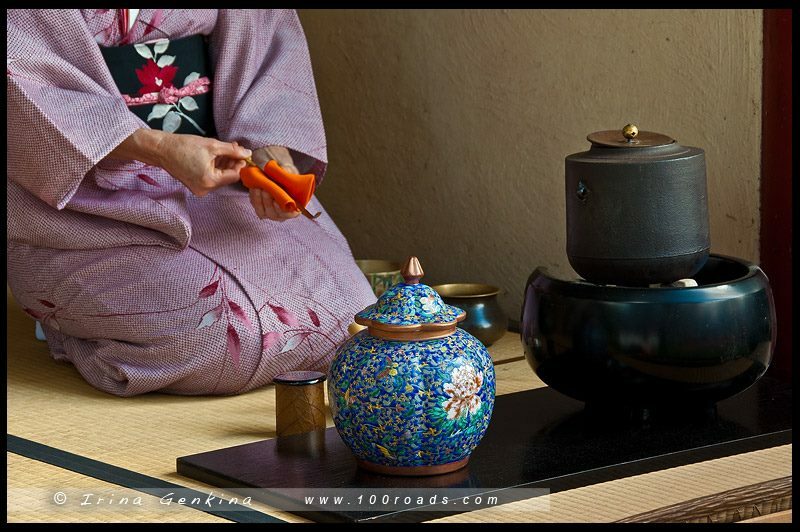 Many people requested to be served tea on the tatami and three groups were shown how to whisk their own bowls of tea! In all about 40 bowls of tea were served.